Years ago I was a fan of Cecelia Ahern’s, back when she wrote P.S. I Love You and Love, Rosie – but then she started writing books that bordered more on the line between reality and fantasy, which is pretty much not my cup of tea. So, sorry to say, I wrote dear Cecelia off for a few years. When I read about her upcoming novel and realized that it was actually 100% reality based, I was pleased at the chance to return to reading Ahern’s work. One Hundred Names is a heartwarming tale that offers valuable life lessons and insight into the power that our actions can have on our lives. Kitty Logan is an up-and-coming journalist who has made the biggest mistake of her career – and ruining the reputation of an innocent man while doing it. She is facing action in civil court, a scourging from the press (those who were once her own kind), and the end of her television career. The one thing she has been able to salvage is her job at the magazine, Etcetera!, at which she has worked from the beginning of her writing career. Unfortunately, her editor, mentor, and dear friend Constance is terminally ill and after promising to tell Kitty about the one story she always wanted to write but never did, passes away before being able to do so. Kitty is left with a list of one hundred random names as the only clue to the story of a lifetime that could possibly redeem her in the eyes of her co-workers, her friends, but most importantly, herself. Kitty has only two weeks to research and write this story – and she’s starting from scratch. As she begins to research the people behind the names, she embarks on the journey of a lifetime in which she discovers new friends, a new love, a new perspective, and… her true self once again. I did not find Kitty to be a sympathetic character in the beginning of this novel – she seemed to be quite egocentric and there was much “poor, poor, me”-ing going on when she in fact should have been worrying about the life she had ruined with her bogus television report. Not until the story began developing further did she become a more likeable person, who worried about others more than herself and who actually began to learn from the people she was meeting along the way. By book’s end, I had warmed considerably to Kitty and truly wanted a happy ending for her. By far, my favorite character was 85-year-old Birdie – the first person from the list that Kitty meets in person, and who remains a part of the story until the end. She is charming, feisty, and wise and has a wonderful story to share – once she feels safe enough to share it, that is. Many of the secondary characters from the list have unique personalities and stories that struck my fancy and charmed a smile from me on more than one occasion. Ahern’s writing is simple, but that does not mean that it is basic. Instead of focusing on language and setting, she allows her characters to truly shine and steal the show. One Hundred Names is not Ahern’s best book but by no means should you pass up the chance to read it. You will not soon forget the eye-opening message and lasting impression that this novel holds inside for you. 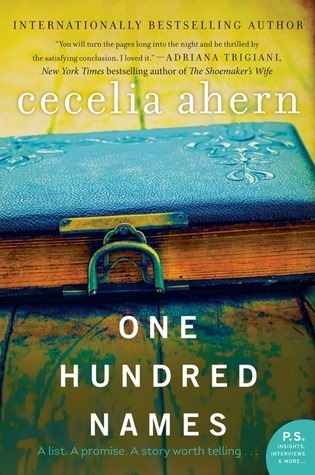 One Hundred Names by Cecelia Ahern. Buy it, read it, love it. I like her fantasy-infused writing myself. I thought that was all she wrote, actually. I’ll be checking out this book as well, so thanks for spotlighting it. It’s a great read, Mira. Hope you like it!